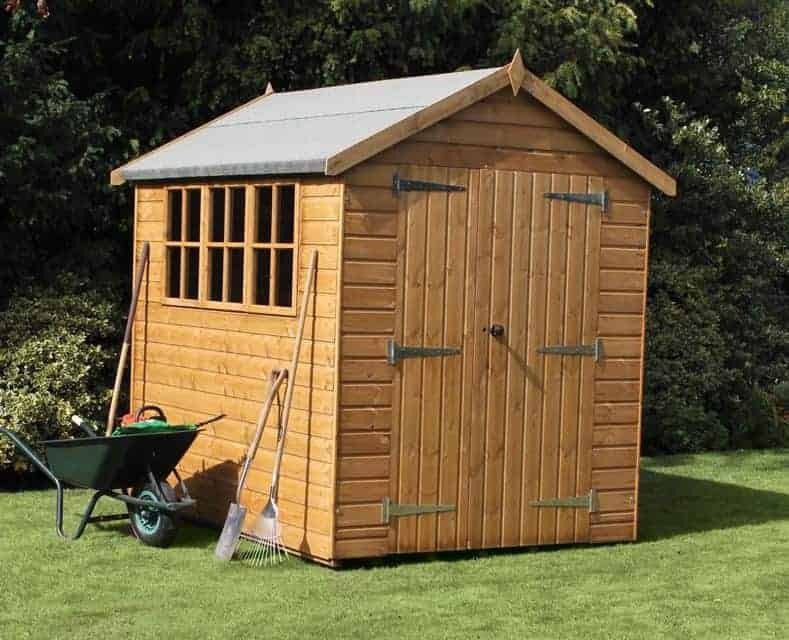 This appealingly traditional timber shed would grace any small to medium garden, and thanks to the tall headroom provided by the apex roof it can be used to store tall and wide garden equipment and objects. Thanks to its three windows, one of which opens to allow natural ventilation, it can also be used for so much more. We can easily imagine this being used as a compact yet accommodating workshop for a hobby, or even a place to use as a home office. The apex roof not only gives additional storage space, it also proves effective at repelling rainwater, especially as it’s made from tough cladding that’s covered in strong mineral roofing felt. Water protection is also helped by the planed shiplap tongue and groove cladding used right across the shed. It not only creates a stylish and pleasing smooth appearance, it means that there are no weak points for water to penetrate. With all this taken into consideration, however, we would have liked to see a longer warranty period against rot. If you plan on keeping items of value inside, then security becomes a priority. We all hear read about shed crime being on the rise, which is why we were pleased to see a sturdy looking key operated looking system included as part of the standard package. In many ways this looks like a very traditional shed, thanks to its imposing apex roof and three windows, yet it also takes advantage of modern shed manufacturing techniques. One example of this was the use of PAR cladding throughout the entirety of the shed, including the roof, rather than using less expensive materials such as OSM for roofs and floors. We were very pleased to see this, and it was a good indication of the overall high quality of the shed as a whole. The roof should prove both strong and durable, and it also ensures that the vertical height is as generous as the width and depth, which isn’t something we always find. 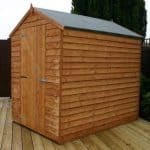 The ridge height is 2.46m and the eaves height is 1.85m, and the overall depth is 3.05m accompanied by an overall width of 2.44m on the side containing the door. We’ve already mentioned the cladding, and that’s because it’s one of the standout features on this shed. It’s 12mm thick, which is what we often find on medium and large timber buildings, yet in this instance it’s made of PAR tongue and groove which, by being planed all round, gives added strength and toughness. It also provides added stability when used with the heavy duty 44 X 44mm framing. In our opinion, this makes it an excellent choice for gardens that are often subject to high winds. We were glad that the floor was made of the same tough and reliable cladding, but we would have liked to see it raised from the ground and thus protected from the ever present threat of ground moisture. 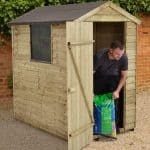 To do this, the customer has to buy an optional set of floor bearers costing £52.99, but we feel that they should have been included as standard in a shed belonging to this price range. 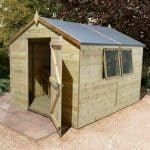 With high quality tongue and groove cladding used for all external surfaces, and an apex roof that causes rainwater to bounce away, we would expect this shed to remain rust free for a long time. Unfortunately, however, the manufacturer’s warranty period doesn’t reflect this as only a one year warranty is provided, as opposed to some we see that last a decade or longer. 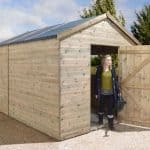 There is also an onus on the customer to treat the shed with wood preserver just six weeks after installation, and then on an annual basis. This reflects the basic initial dip treatment used by the manufacturer, which we would have liked to see upgraded to a longer lasting pressure treatment. We always feel the door is one of the most important, yet overlooked, features on a shed, because if it’s too small, the owner may have to twist and turn to manoeuvre objects in and out, and this can impact on health and safety. Thankfully for a single hinged door, this was wider and taller than we usually see, measuring 0.76m and a very generous 1.83m respectively. We were pleased to see that three windows had been included, and especially that they featured tough horticultural glass; it’s a shatter resistant glazing that should resist accidental impact. We were also pleased to see that whilst two of the windows were fixed, one could be opened, which is a great way to ventilate the shed and regulate the internal temperature. Put simply, it creates an interior that’s pleasant to spend time in. The toughened glass in itself can act as a deterrent against shed crime, but the security feature we appreciated most was the key operated locking system. It looks strong and solid, and it was good to see it included as standard rather than placing the emphasis on the customer sourcing their own lock as some manufacturers do. Whilst we found the door both wider and taller than most single doors on the sheds we review, there is an option to extend the entranceway still further by upgrading to double doors. Creating a 5’ wide opening, this is an ideal solution for people who plan on moving objects such as mobility scooters or ride on lawnmowers in and out. Another way in which the shed can be customised is by removing the windows all together. The fully boarded option, available at no extra cost, gives greater security by preventing people from knowing what’s kept inside. Another option which we can imagine being very useful to many customers is the professional installation service. Costing £159.99, it ensures a perfect assembly while saving time as well. The use of PAR cladding is a good indication of quality, and this was confirmed by touches such as chamfered edges on the frame. Whilst the cladding itself should be durable, its longevity is dependent upon the customer themselves regularly applying wood preserver, rather than the initial treatment used by the manufacturer. 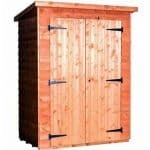 With a taller than average eaves height, this provides a good storage capacity for a small or medium sized garden. The assembly instructions are clear and easy to follow, and two people should be able to complete the installation process in around five hours. An installation service is also available. 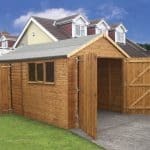 Whilst it is attractive and well built, with some good features, we feel that this is a lot of money to pay for a shed without an extended warranty or a long lasting preservative treatment. Final Thoughts: The heavy frame and superior quality shiplap cladding used on this shed make it well worth considering for those whose gardens lie in exposed areas, but still want the storage benefits offered by a traditional timber garden building. We were pleasantly surprised at just how much can fit inside, thanks to the taller than usual eaves and ridge height. The door too is taller than most that we see, which will be welcomed by taller owners. We would have welcomed a longer warranty period, especially at this price, but as long as the six week and then annual treatment requirements are kept up this should still provide a long lasting rot free garden building.